In this post I’ll give an example of how you can validate a field in OIS100 using JScript. The scenario is as follows: All orders with order type “E50” has to be from faclity “FC5”. 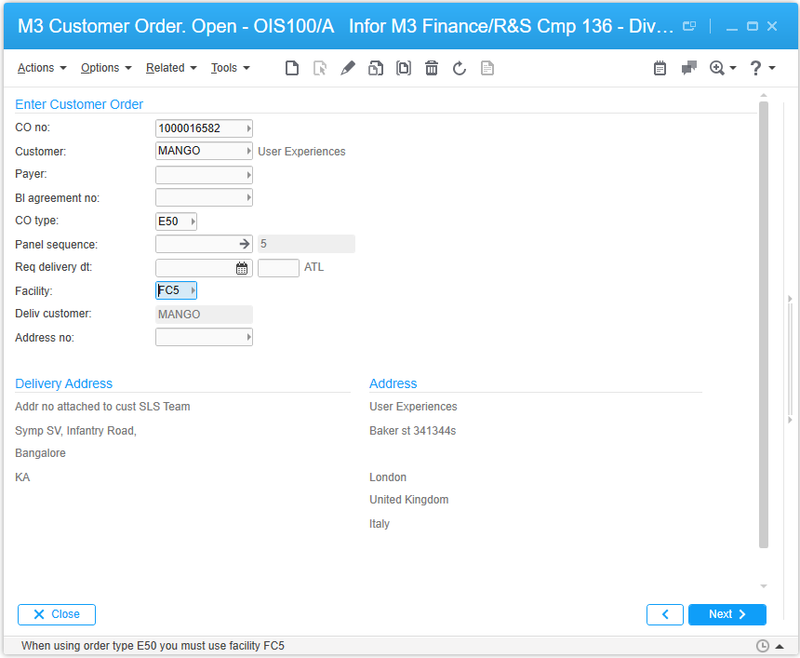 How can you validate input in OIS100/A? This was the question from one of our readers. The script is pretty straightforward as you have all the data that you need to check on the panel so I created a small example to illustrate the use of OnRequesting. Please note that you could make this script better by using script arguments. If the order type and the facility does not match the required condition the facility is updated and a message is displayed. // Attach event handlers to be able to detach event handlers and list to page down requests. // Do not disconnect events on page down. This entry was posted in JScript and tagged OIS100, OnRequesting, Validation on March 15, 2016 by Karin Portillo. When working with JScript you might want to open a new window. There are a few different ways that this can be done and today I’ll share how to create a new window that is visible in the taskbar and how to open a modal window. Modal means that you cannot access any other Smart Office functionality such as the QuickNote widget or data in a form as the modal window is the only currently active window placed above all other windows. 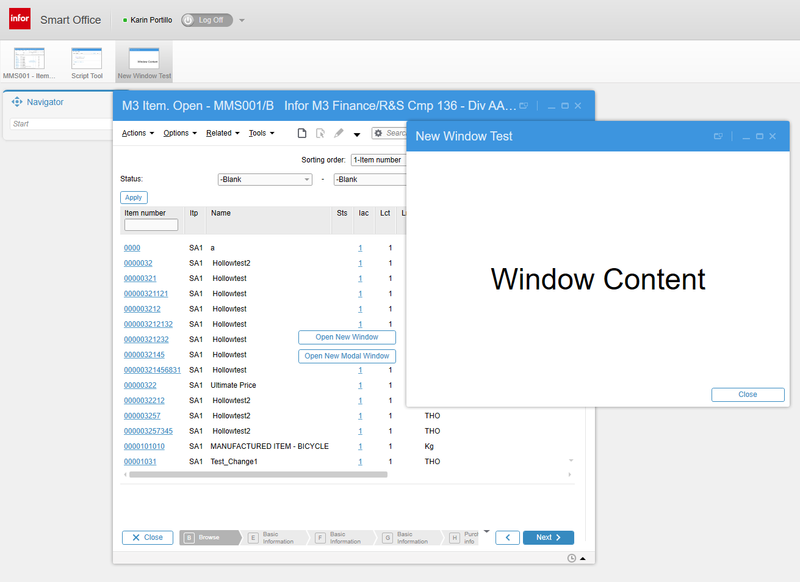 A modal window is a graphical control element subordinate to an application’s main window which creates a mode where the main window can’t be used. The modal window is a child window that requires users to interact with it before it can return to operating the parent application, thus preventing the workflow on the application main window. This is great for some cases but can also be frustrating. Some of the concepts when working with windows in Smart Office is IInstanceHost – which represents the contract to an application host window. Then if a window is visible in the TaskBar it has to have a Runner – a handle to a task running on the Canvas. A Task is an item that can be launched on the Canvas. A task can only be launched if there is a registered application that supports the task. The scheme part of the task URI is used to locate an application that can launch a specific task, form example mforms://mms001. All these interfaces and classes can be found in the Smart Office SDK API and some of them in the API Documentation under Help in the Mashup Designer. When writing JScripts you should be familiar with the Smart Office core programming concepts. There are new overloads of LaunchTask that can open a window in different ways. If the code does not work on your version of Smart Office it is possible that the method used does not exist in your version. Below is an example from Norpe on how to create a non modal and a modal window with JScript. Enjoy. If you don’t want to have modality to the new window you can create a window that shows up in the task bar using an overload of the LaunchTask method. The script below shows examples of how to launch a modal window and a non-modal window. DashboardService.Current.ShowDialog(host); // Use DashboardService to get modal "shake". This entry was posted in JScript and tagged #dialog, #window on November 5, 2015 by Karin Portillo. Changing the appearance of M3 list cells with conditional styles is easy but in some cases you need to do things that require logic that cannot be expressed with conditional styles alone. This post will show you how to change the style of list cells in M3 lists using JScript, custom data templates and custom data template selectors. This entry was posted in JScript and tagged DataTemplate, JScript, M3, Personalization on August 21, 2014 by norpe. This post is a follow-up to a question in the comment section on a previous post called Adding a new column in a M3 List. The question was how to add a clickable hyperlink in a new list column. This could be solved in a generic way by creating your own data template and template selector or by reusing existing functionality in MForms. In this post I will just cover the second part by reusing existing functionality. The more generic solution for custom content in list cells might be covered in a future post. This entry was posted in JScript and tagged JScript, M3, Smart Office on April 25, 2014 by norpe. The user’s canvas is where the user has his shortcuts and widgets monitoring business data. The first time the user starts Smart Office she will get the default Canvas with the content that an administrator has configured. In this post I’ll show you how to share a canvas file on a fileshare and create a Jscript that will load the Canvas everytime Smart Office starts. This entry was posted in JScript, Smart Office Administration, Tips and tagged 10.1.2, JScript, M3, Task on January 21, 2014 by Karin Portillo. This entry was posted in JScript and tagged JScript, Modal, webbrowser control on August 27, 2013 by norpe. When extending the functionality of M3 panels in MForms you have three different options and these are JScript files, Script assemblies and MForms extensions. MForms extensions allow you to do similar things as with a regular JScript files but extensions are Smart Office features, written in a .NET language such as C#. The way extensions are deployed, configured and registered is also somewhat different compared to how you usually do with JScript. This post is a brief introduction of how to create and deploy an MForms extension using the Smart Office SDK. Note that if you don’t have access to the SDK you will not be able follow along in the example on your own. I will also assume that you are familiar with the Smart Office SDK and will mainly focus on what is specific for MForms extensions. This entry was posted in Feature - SDK development, JScript and tagged extension, Feature, JScript, M3, MForms, SDK on July 10, 2013 by norpe.